Ian is the founder of Tuscan Tennis Holidays in 1994. He has established himself as one of the top coaches in Scotland and holds the highest qualification attainable in the UK, the PCA Master. After living in Italy over a 10 year period (coaching & playing tennis) Ian then decided to return home to Glasgow. That same year in 1994 several members at Ian's club asked to be taken over to his new home for a tennis holiday. From these humble beginnings with a few friends who loved tennis and a desire to experience an insiders view of Tuscany a successful holiday company grew! The essence of the holiday has never changed in that Ian would like to help you get to know a wonderful country from a local perspective and improve your tennis at the same time. Combined with managing a highly successful racquets and health club in Glasgow he continues to coach aspiring juniors up to national level and enjoys working with all levels of junior and senior players at the club. He is a Scottish Internationalist who has played and coached tennis in America and Australia. Ian has also lived and travelled extensively throughout Italy and so can provide plenty of recommendations re places to visit, restaurants etc. He speaks fluent Italian. Laura has been part of TTH from the very first year when she became Ian's assistant coach for the first group in 1994. She was on holiday at the time but so enjoyed the experience that she quit her job as a bank manager to join forces with Ian and has remained ever since. Laura has also been instrumental in helping to set up the tennis programme Miss-Hits, together with Judy Murray, which is part of Judy's drive to get more girls involved in tennis. Laura has also been a Scottish Internationalist at both junior and senior levels, and she is a highly experienced LTA coach. Apart from running the office of Tuscan Tennis in Glasgow, Laura is also instrumental in the success of our special hosted weeks. 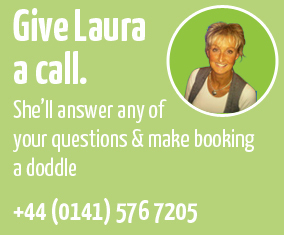 Laura also speaks fluent Italian and her knowledge of Tuscany and Italy in general is extensive. Watch Laura play Andy Murray!